"The 1858 Italiante building was converted into a museum of astronomy in 1988. The Tower's time-ball still drops daily at 1pm, while a cannon is fired simultaneously from Fort Denison." "Lieutenant Willam Dawes established Australia's first observatory on the point that now bears his name. 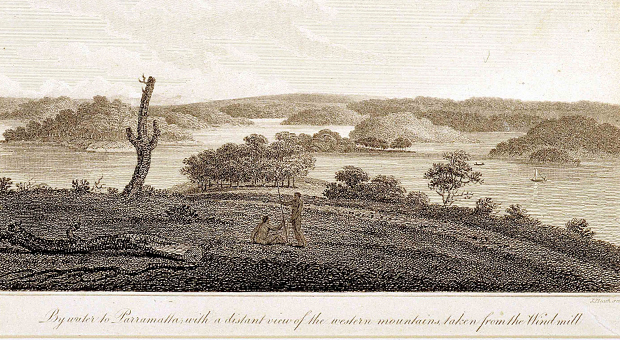 In 1790 he earned Governor Philip's displeasure when he refused to join a reprisal attack against Aborigines. His refrusal sprand from a relationship with an Eora woman, Patyegarang. Dawes' journals detail his converstaions with Patyegarang and document the vocabulary and grammer of the Eora. Dawes was shipped out in 1791 and spent years campaigning against slavery in the west Indies." I've always thought it was such a shame that men of cultural sensitivity like Dawes were not encouraged to stay in the colony during the early years. Our troubled history with the Aborigines may have proceeded quite differently if men like dawes were in charge, or had a say. In 1797 a windmill was built on the hill above the first settlement. This was the highest point of land in the early colony consisting of a rocky, steep ridge. The windmill deteriorated quickly - the canvas sails were stolen, a storm damaged the machinery and by 1800 the foundations were crumbling. The area was named Windmill Hill, but now the surrounding Millers Point is the only reminder of this earlier history. View from atop the Observatory looking towards Balmain. 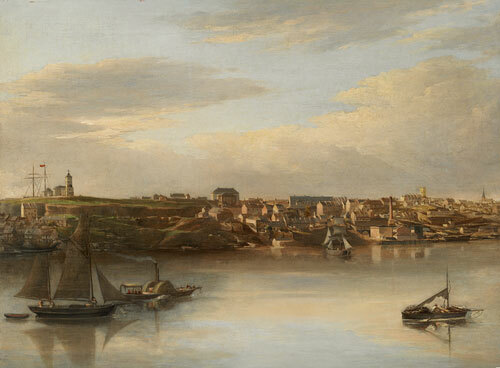 In 1803 the name of the hill changed to Fort Philip. Governor Hunter built a fort to defend the new settlement against a possible attack by the French and also from rebellious convicts. The fort was never required. The eastern wall of the fort was converted to a signal station in 1825. Flags were used to send messages to ships in the harbour and to the signal station on the South Head of the harbour. By the 1830's the sandstone cliffs at the bottom of Observatory Hill were being cut into to make way for the shipping industry developing in Cockle Bay, Darling Harbour. Mortimer Lewis (colonial arcitect 1835 - 1849) began building a proper signal station on the site in 1848. A few years later, Governor Denison agreed to build a full observatory next to the signal station. The first official astronomer was William Scott, appointed in 1856. His new observatory, was designed by William Weaver (during his time as colonial architect 1854-56) but built by his successor Alexander Dawson (1856 - 62). It was completed in 1858. The southern dome contains an equatorial refracting telescope, installed in 1874 to observe the Transit of Venus. The dome is made from a Muntz metal - a copper-zinc alloy and sits atop an octagonal tower. The time-ball was the new Observatory's most important feature. The only change to the ball since it's first use on the 5th June 1858, is the motor that now mechanises the raising of the ball in preparation for the 1pm drop. I took a brief video of the time-ball dropping but, I can't seem to make it work here. The north dome was added in 1878 to allow for a view of the eastern sky. It now houses a modern computer controlled 40cm reflecting mirror telescope. "Observatory Park: Given its location beside the southern approach to the Sydney Harbour Bridge, this small park below the Observatory is surprisingly peaceful. It offers great views of the working harbour. Near the bandstand is a memorial to the Australians who served in the South African War (1899-1902)." The Museum of Applied Arts and Science website is here. 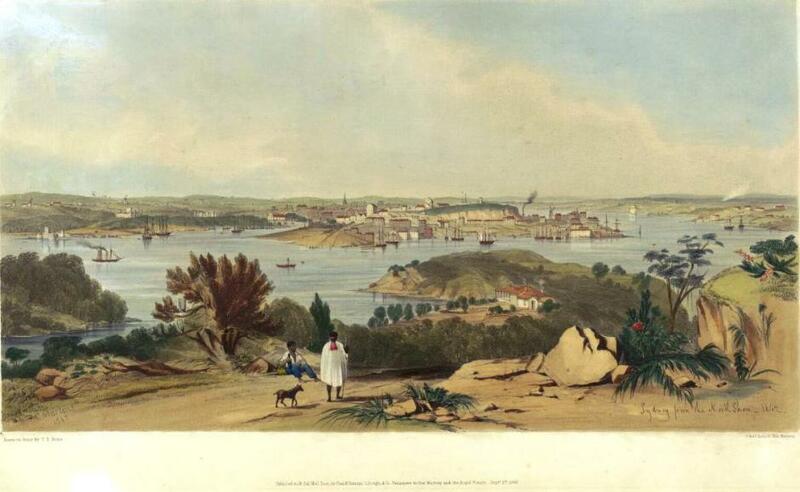 The Gadigal peoples were the original inhabitants of the area around Observatory Hill, Millers Point and Dawes Point. They co-existed with the European invaders in this area, that became known as the Rocks, until about 1840. In 1788, it was estimated that about 1500 Aborigines lived in the area, but more than half probably died after the 1789 smallpox epidemic. Thanks for sharing this history, and the gorgeous architecture. It is so true that people who are in charge definitely affect the outcomes of a country...and that all seems very poignant now, for some of us in the US. Beautiful photos and interesting history. I love the historical illustrations. Such great pictures, and thanks for the history! Even though I have a degree in History, I know very little about Australian History! What lovely photos. I think there is a ball like that at the observatory in Greenwich, London. I love that you are making a quest of seeing Sydney as a tourist might, taking the time to see things that residents don't usually see- I've never managed a visit to the Observatory even though I lived in Sydney for 10 years ( and don't I wish I'd had enough money to buy a house back then?). And how I wish the French had invaded Australia, I'd be much more fluent.